Last year I posted an article from 1880 talking about the many public squares that the city had in use. One which was lost due to urban renewal in the late 1960s was Haymarket Square at 5th & McKinley. The area is now mostly taken up by a large WE Energies substation and several vacant buildings. The dismantling of the Park East freeway on the other side of McKinley has left a large area waiting for development and improvement. Questions have come up, especially at the recent Envisioning the Seen program sponsored by Historic Milwaukee, Inc., as what should be done to spur development of the Park East. 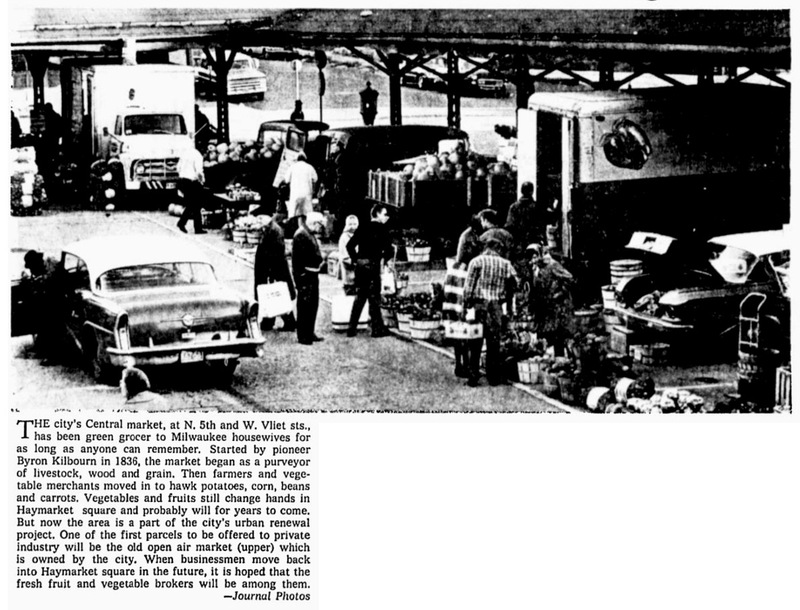 I say we should bring back a public market square. This would be instantly used by residents at Hillside Terrace who have no grocery or market nearby and would help to promote mixed use development in the Park East. Markets elsewhere in the city are well used as a source for fresh, healthy and cheap vegetables. Public parks and markets are places in the city which can turn vacant space into used space and provide something which can attract development. 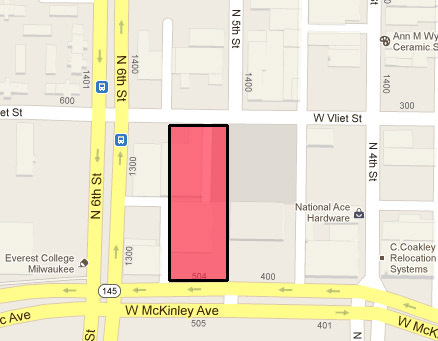 How many developers want to take a risk on a vacant area that has no life? An actively used public space will make adjacent lands that much more valuable and attractive. Unfortunately after Richard Perrin made the decision in 1966 to squeeze the last of the activity out of the area with the urban renewal project, the seeds of development could never take root and today we are left with vacant buildings and deserted space. The proposed Haymarket Sqaure urban renewal project was discussed at a one hour public hearing Tuesday. No objections were heard from the more than 70 persons present. Eleven persons said they favored the project. The 60 acre, L-shaped area is bounded roughly by W. Walnut, N. 3rd, W. McKinley, N. 8th, W. Vliet and N. 6th. Nearly 21 acres will be cleared and 14.4 acres rehabilitated. Streets and alleys occupy the other acreage. The city redevelopment authority hopes to remove all residential structures from the area making the land available for expansion of existing businesses and for new industry. The authority is not expected to give its final approval to the plan until Nov. 10 because it must allow property owners 15 days from the hearing, or until Nov. 9, to file written objections. Final action then will be sought from the common council. Richard W. E. Perrin, the authority’s secretary, said land acquisitions could begin by next January. By mid-1968, he said, it is possible that all land involved will have been acquired and cleared. The entire $3,241,058 cost of the project will be borne by the city – making it the first such project in which no federal funds for renewal will be used. The city is expected to recoup about $1,600,000 from the resale of land to developers, placing the project’s net cost at $1,640,000. According to a new survey, the city will have to relocate 60 families, 166 individuals, 55 businesses, and 7 institutions from the area. City planners had estimated earlier that the project would uproot 133 families and 75 individuals. At the hearing Richard Bosely, owner of Graphic Studios, 1331 N. 3rd st., asked that the project be amended so that something could be done to beautify the east side of N. 3rd. Much of it consists of railroad lines and loading-unloading areas. Calling the street the “front yard” of the project because it carries heavy traffic to and from the downtown area, Bosely suggested that a brick retaining wall with greenery on top be used to screen that side of the street. 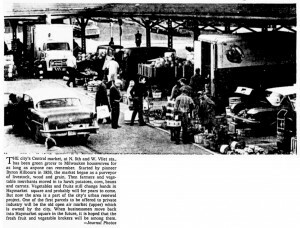 John Budzien, representing Milwaukee Gowers, Inc., 519 W. McKinley av., urged the retention of the farmers’ market in the area. Its proposed removal, he said, would create an economic hardship for the firm. This newspaper story from 1880 tells the background of several of the important public squares that were in use at the time. Haymarket Square at 5th and McKinley no longer exists after being part of a city redevelopment plan in the late 1960s. It’s site now houses several buildings which are vacant and a power company substation. Rink Square is now where the Wisconsin Center stands at 5th & Kilbourn. Market Square is where the City Hall stands. SOME INTERESTING FACTS ABOUT DONATIONS IN EARLY DAYS. CONDITIONS AND STIPULATIONS UNDER WHICH THE PROPERTY WAS GIVEN – COURTHOUSE, MARKET, HAY MARKET AND OTHER SQUARES. In the days when Milwaukee was yet a village, and its present prominence undreamt of, it was frequently the case when a plot of land was added to the city, to reserve a portion for public use, the donor at the time making such conditions regarding their future use as he saw fit. Land was not worth $500 a foot on the banks of the Milwaukee River nor had the wildest dreams of the owners conceived it possible that real estate would ever reach that figure. This fact is mentioned to show that the gift of a block then was different pecuniary matter than a like donation today. Many of the original squares have been enlarged by purchase, while others have been used for a purpose other than that for which they were dedicated. This does not interfere with their eligibility for the use to which they are put. The world wags on apace, and, if the original conditions of the benefactions are forgotten, it is because in the flight of time, their usefulness in the sphere for which they were intended has passed away. In 1835 there was filed in the City Engineer’s office the map of survey of a plot on the West Side of the river, in which was contained one-half block marked “public,” situated on Third street, between Court and Galena. It was specified that this block was given for the erection of a court house, but no other building should be erected thereon. Moreover the court house must be erected within two years from date, or the property was to revert to the original owners. If at any time thereafter, the county should erect a court house elsewhere, or neglected to hold the courts there for three consecutive seasons, it would then revert as aforesaid. If, on the other hand, the reserve was used for this purpose the proprietors of the estate agreed to set apart one lot elsewhere in the town, eligibly situated for a jail, as soon as the county signified a willingness to erect such a structure. The town decided not to erect a courthouse there, and the reservation was left unenclosed and public until 1870, when the authorities purchased the remainder of the block, having in view the erection of a public school building. the project was carried out and the Humboldt public school is the result. At the same time three other reserves were made for the public, namely: A block on Fifth street, between Poplar(McKinley) and Vliet, known as Haymarket Square, a half-block on Fifth street, between Cedar(Kilbourn) and Tamarack(State), known as the Rink Square, and a half block on Sycamore(Michigan), between Third and Fourth. In the dedication, the donor specified that no obstruction in the way of buildings should be placed thereon except market buildings, on penalty of reversion to former owners. Hay Market Square is the principal live stock market of the city. The Rink reservation will be utilized, together with the remainder of the block, purchased for the purpose, as a site for the Exposition Building. In 1836, the Court House Square (then half the present size) was dedicated to the common use, by Solomon Juneau, for the purpose of erecting a court house. No other building could be erected thereon, nor should the lot ever be obstructed in any way. Moreover, it was specified that the space should be enclosed by the corporation. The same year a courthouse was built. In 1866 a remainder of the block was purchased by the municipality and the present stone structure erected thereon, and the grounds beautified by a fountain and other embellishments. Market Square on East Water street, was about the same time given for a public market. This reserve has never been improved much, and stands sadly in need of improvement. A fountain should be placed there, and other innovations brought about, tending to transform a dusty street into a pleasant lounging place. Some such measure introduced would add much to the attractiveness of the Market, and entail good on the neighborhood. “It is a just remark,” said a gentleman, “that no large public park near the centre of the city is a lack to be regretted, and, although it cannot be well remedied, the regret may be in a measure mitigated by improving the small public squares and making them attractive.